A sophisticated rendition of the original masterpiece, the G6136T-59 Vintage Select Edition '59 Falcon Hollow Body with Bigsby combines period-accurate features and appointments from the golden age of electric guitars. 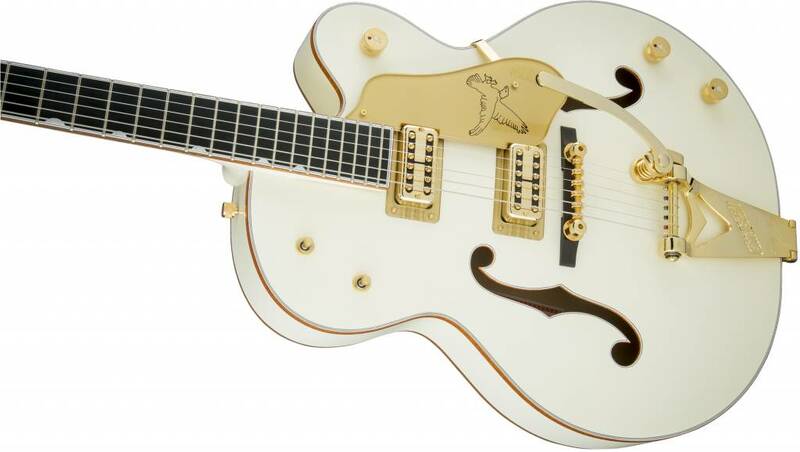 Satisfying eyes and ears with its golden tones and gleaming looks, this rare bird comes alive in the player's hands, singing with its distinctive voice at every strum. A pair of TV Jones Classic pickups generates powerful tone and unparalleled dynamics. The new Gretsch "Squeezebox" paper-in-oil capacitors provide an incredibly silky high end. Add some expressive shimmer to your playing with the Bigsby B6GVT vibrato tailpiece while the pinned Space Control bridge and bone nut combine for impeccable tuning stability. A highly resonant 3-ply maple top with 1959-style trestle bracing and multi-ply laminated maple back and sides make this instrument a veritable cannon, firing off notes with incredible projection and rich, balanced tone. 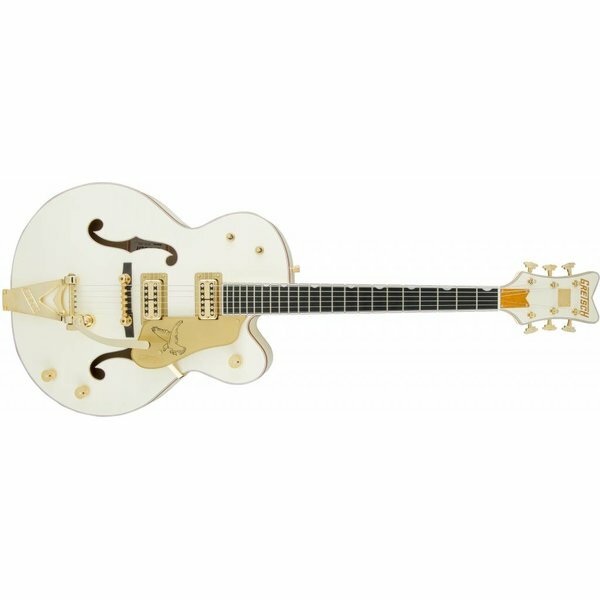 A maple neck with a comfortable and versatile standard "U"-shaped profile for supple playability is capped by a 12"-radius ebony fingerboard with 22 medium jumbo frets and classic Gretsch thumbnail inlays, making complex chords, far-reaching bends and intricate single-note playing effortless. Authentically iconic, this striking guitar displays gold hardware-including the gold jeweled "G Arrow" knobs- gold sparkle bound neck, body and F Holes, vintage white gloss nitrocellulose lacquer finish and gold vintage thick plexi pickguard with Gretsch logo. With its stunning looks and huge sound, the iconic G6136T-59 Vintage Select Edition '59 Falcon Hollow Body with Bigsby is the crown jewel of Gretsch guitars. Includes a deluxe hardshell case.